I’ve struggled with getting quality sleep for years, and I’ve slowly been able to pinpoint what wrecks my sleep and what I need to do to restore it. 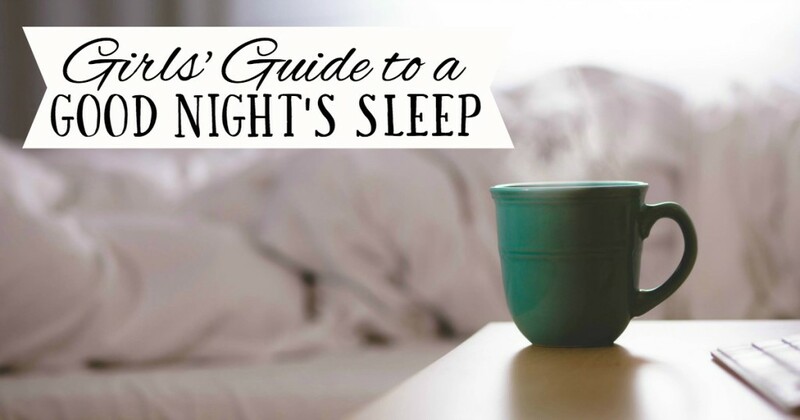 I’m sharing what has helped me finally get good quality sleep, and fall back asleep if I wake in the middle of the night. You guys know I love simple solutions, but when it comes to sleep, things get complicated. I never had major sleep problems until I had kids. Since my babies were born 18 months apart, and they were both terrible sleepers, I essentially didn’t sleep much at all for about five years! Finally the day came when both kids started sleeping a solid 11+ hours at a time. It was the magical milestone I’d dreamed about for years. But instead of basking in hour upon hour of blissful, uninterrupted sleep, I found myself struggling with insomnia — frequently waking in the middle of the night, unable to get back to sleep for hours, if at all. I know I’m not alone. Whenever I bring up insomnia and nightwakings to other women, they all nod their sleepy heads in agreement. Men can have sleep issues too, but women suffer the most. My issue isn’t falling asleep, it’s staying asleep. I easily fall asleep each night, but I usually wake at some point between 2:30 and 3:30 am. On a good night I can fall back asleep right away or after a few minutes; on a bad night I can be up for hours. But I refuse to go down without a fight. I’ve dedicated a LOT of time over the last few years to reading, researching, and experimenting with solutions to getting a good night’s sleep, and I’ve learned some things that have really helped. I’m writing this post to share what has helped me in the hopes that it can help you, too. Disclaimer: I am not a doctor or a sleep expert, so please don’t take any of this as medical advice. I’m just sharing what has worked for me. I’m focusing on natural sleep solutions in this post, but medication can be an option if you’re having serious sleep issues, so please contact a doctor if you’re dealing with major insomnia or sleep problems. It took me a while to correlate my worst nights of sleep with my menstrual cycle, but once I did I had a major AHA! moment. I started tracking when my sleep problems were the worst, and I noticed that the days leading up to my period were by far the worst for sleep. I also realized that a lot of my sleep problems began after I had my IUD removed. Because that happened at the same time that we were planning a cross-country move, I attributed my worsened sleep to stress, but I think it was the reduction in estrogen that happened after my IUD removal that was also to blame. (Read about female hormones and their effect on sleep). This probably isn’t news to anyone, but stress is also a major sleep disrupter. The times when we were planning moves or dealing with major decisions or worries were by far some of the worst nights of sleep I ever had. When I would wake up at night, my brain would just spin endlessly about all of the things I needed to do and decisions I needed to make, and I found it impossible to go back to sleep. Having wine or another alcoholic beverage at night can help you to fall asleep, but as we age it can also majorly disrupt our sleep. I definitely notice that I sleep more poorly if I have alcohol too close to bedtime. I’ve also noticed that red wine is the worst sleep-wrecker for me, which is a bummer because it’s SO GOOD. (Read more about alcohol and its effect on sleep). Pinpointing the factors most likely to ruin my sleep was a huge step in the right direction, but there were other, smaller things that affected me as well. So I created this list, or “recipe,” of the things I do in order to have a good night’s sleep. This is by far the most complicated recipe I’ll ever share on this blog! I don’t do all of these things every day, but when I’m desperate for a good night’s sleep, I know that following these rules will help me get one. Note: Some of the links below are affiliate links via Amazon.com. I’ve only linked to the products I actually own and use. The hormone issue isn’t going away anytime soon (it will only worsen as I get closer to menopause), but being aware of where I am in my cycle definitely helps. Since I know in advance when my sleep is likely to be “off” (usually the week before my period), I can compensate by being extra vigilant about following these tips, and going to bed earlier than normal to make up for a potentially restless night. I have become the queen of the “early bird special” style of eating (and drinking). We don’t go out for dinner often, but if we do, I always want to make the reservation for 6:00 at the latest. When we eat later than that or eat a large meal, I almost always regret it sometime in the middle of the night. The same goes for alcohol: If I want a good night’s sleep, my “window” for having a drink needs to close by 8:00 pm. Any later than that and I’m usually up in the middle of the night for at least an hour or two (see article above for more info on alcohol and sleep). If you have a snoring spouse, a ticking heater, or crazy confused birds that like to chirp outside your window at 1:00 am (I have all three), I highly recommend using a white noise/sound machine to help drown out the noise (this is the sound machine I use, on the “rain” setting). I realize this might not be a viable option if you have babies or little kids you need to listen for throughout the night, but you can try experimenting with various settings and volumes to find something that works for you. Ours is so quiet it’s barely detectable, but it still helps to mask some of the pesky noises that might otherwise wake me up. I definitely sleep a lot better when it’s cool, almost cold, in the house. This became very evident when our heater died a few weeks ago. Our house got down to about 60 degrees overnight, and I slept great! Now I make an effort to keep the bedroom as cool as possible at bedtime. I used to always put our bedroom last on my “rooms to clean” list because I figured nobody ever saw it except us! But I’ve noticed that when I go to sleep in a clean and tidy bedroom with a made bed and no clothing on the floor, there’s just a sense of calm in the room that helps me fall sleep more easily AND fall back to sleep more easily if I happen to wake in the middle of the night. I’m guilty of not always washing off my make-up properly before going to bed when I’m really tired, and I can tell it affects the quality of my sleep. If I wake at night with an unwashed face, I just feel icky, and I either have to get up and wash it right then and there or lie there thinking about it. I feel like my quality of sleep is better when I read for a few minutes before bed. I also like to keep a semi-boring book on hand for those nights when I wake up and have trouble falling back to sleep. Sometimes reading for a few minutes can help me clear my brain of its incessant chatter and list of “to do’s,” and help me fall back asleep faster. On days when I’ve exercised or been very active, I almost always sleep better. I don’t sleep nearly as well when I’ve just been sitting in front of the computer for hours on end. If I don’t drink enough water during the day, I’ll often wake up feeling super thirsty in the middle of the night, sometimes several times. I sleep best when I’m nice and hydrated. The best way to do this is to fill up a large cup or water bottle and carry it with you throughout the day. I think we all know that drinking caffeine close to bedtime will wreck our sleep, but as I get older I notice that even my morning caffeine intake can really affect my sleep.The older I get, the more sensitive my body is to EVERYTHING. I’ve tried to limit my caffeine to just one cup of coffee in the morning (sometimes two if I really feel like I need it). Research shows that regular daily meditation can help you with daily stress and nightly sleep. Even if you don’t meditate regularly, learning a few simple breathing techniques, like this 4-7-8 breathing exercise can help you to relax and fall back to sleep at night. You can find lots of information online about using essential oils for sleep. I’m not well read on essential oils, but I do keep a lavender-based oil blend on my nightstand, which I like to put on my neck and wrists before bed. I don’t know if it’s the oil itself that helps me sleep, or the ritual of smelling the same scent at night, but it definitely makes me feel more relaxed. This is a fairly new discovery, but I do think it helps! After I read several articles mentioning tart cherry juice as a great natural sleep aid (here’s one of them), I had to try it out. I bought this tart cherry juice concentrate and gave it a whirl. I really did feel that it helped me to sleep better and longer. Tip: I like to mix the concentrate with a little bit of sparkling water. It actually tastes really good that way! Whether it’s writing things down before bed, practicing meditation, reading the Bible, doing yoga, going for walks, reading books, calling a friend, paring down your schedule, watching Real Housewives, or all of these things, make a conscious effort to reduce the stress in your life. I know it’s easier said than done, but the less stressed you are during the day, the better you will sleep! This might sound strange, but once I embraced the fact that I’m not a deep sleeper and I’m likely to wake up during the night on occasion, it became less problematic. Research suggests that it’s a good idea to get out of bed if you’re having trouble falling back asleep, rather than lying in bed, staring at the ceiling and stressing out about whether you’ll be able to get back to sleep. If I’m feeling “awake” in the middle of the night, and it lasts longer than 10 minutes or so, I’ll get out of bed, pace around and check on the kids, and sometimes read a book with a booklight on the sofa for a while. It takes my mind off of the sleep issue, and most of the time I find myself getting drowsy and drifting back to sleep. Phew, after writing that all down, I’m ready for bed! :) Please share any tips you have for getting a good night’s sleep. I would love for this post to become an ongoing conversation about what does/doesn’t work for you when it comes to getting rest, and I will update the post if I discover anything new along the way! I found that when I started taking a magnesium supplement last summer, my sleep improved dramatically. I’ve had trouble with waking in the middle of the night and being unable to get back to sleep for hours, especially in the fall and winter, since 1998 (seven years before I even had kids to blame it on). This past winter, I was able to get back to sleep pretty quickly, about 75% of the time. The bonus is that for a lot of women, magnesium helps with PMS symptoms. Very interesting — I’d never heard about using magnesium, but I will definitely try it out. Thanks so much for sharing! !